The capital is experiencing a boom in American cuisine: New places are opening almost every week. An RBC Daily correspondent learned from restaurateurs why everyone has fallen in love with burgers and meatballs all of a sudden. Twenty years ago, American cuisine in Moscow was exclusively associated with McDonald's and expensive restaurants where nostalgic expats gathered. Now, it is not so simple for restaurateurs to find a free niche: Diners, stalls with hot dogs, steak houses and other eateries abound in the capital. Just last week, the famous New York burger chain Shake Shack and the Wetzel's Pretzel bakeries announced their plans to enter the Russian market. However, the main drivers of the craze for American cuisine are Russians themselves. A typical New York-style establishment with one table for 15–20 people was opened by a team that had previously run the hipster hairdressing shop Chop Chop. 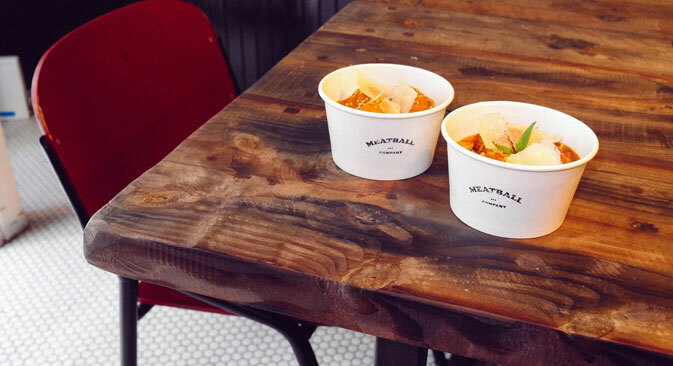 "Initially, we didn’t plan to deal especially with meatballs,” says the co-owner of The Meatball Company, Danila Antonovsky. “It just so happened that this was the most understood and accessible food of New York. Tefteli meatballs are, after all, known by all." Meatballs made of chicken, beef and pork and served with a side dish cost 250 rubles (almost $8). "I would not say this is an exceptional craze forAmerican cuisine,” says Antonovsky. “It is more about the fashion for comfort food — food that you can take in the paper packaging for take-out. This is a consequence of the interest in all that is New York. If we talk about the Western world, then the whole fashion comes from there; Europe in this regard is currently ‘dead.’ This is the reason why we fell so deeply for it." The owners of The Meatball Company have planned to extend their business through franchising, which will cost interested parties 350,000–500,000 rubles ($10,800–15,500). Last fall, the Ferma & Williamsburg kiosks of Fjodor Tardatyan and Maxim Livesey appeared in Gorky Park, serving burgers with rosemary aioli garlic and onion jam and sausages; they also sell farm products such as jam from quince and paste from roasted flax seeds. Following this, Tardatyan set up a kitchen in the establishment Oldich Dress & Drink. A vintage clothing store is adjacent to the bar there; the latter is located on the ground floor and opens only in the evenings. This week, the company opened Farmer's Diner onLesnaya Street — a gastro-pub with a frequently changing menu and staple burgers. “The fashion of Brooklyn is not a specific phenomenon of Moscow,” says Tardatyan. “This is a global trend. I travel a lot, and I see bearded men in Red Wing boots everywhere. Personally, for me, it all started from an interest in New York. I’ve been there about 25 times — this is more often than [I have been to] my country house." One of the prejudices about American cuisine, according to the co-founder of Ferma & Williamsburg, is that it is unhealthy and heavy. "We need to distinguish between the roadside eateries […] and restaurants like Brooklyn's Five Leaves, which was opened by the actor Heath Ledger and the tattoo artist Jud Mongell. It is, in fact, a fine dining style in an outdoor format. All the ingredients out there are of the highest quality,” says Tardatyan.“We also use only farm products and make all the sauces ourselves — no ketchup and mayonnaise!" Tardatyan has achieved impressive results: His burgers were ranked by guests of the Brooklyn Flea fair, and he himself has plans to open a gastro-pub in New York at the end of the winter. Regardingthe chances of popularizing Russian cuisine in New York, the entrepreneur is pretty skeptical. "It’s not of interest to anybody there: Dumplings are associated with Italian ravioli there, pancakes [are associated] with French cuisine,” he says.“If our gastronomy abroad were supported by the state, then it possibly would make some sense." Neither Tardatyan nor Antonovsky have plans to expandinto Russia’s regions; instead, they prefer to concentrate on the Moscow market. “Opportunities for development are huge here,” says Antonovsky. “You can count on the fingers of one hand the places where national meat soup is professionally cooked here. Before we open a new establishment, we never conduct any market research;we just think about what we don’t have enough of in this city. For example, at the moment, we do not have a good wine bar where you can have a drink in the winter without having to take off coats, paying no more than 250 rubles per glass," says the co-owner of The Meatball Company. There is one main obstacle facingthose wishing to open a small restaurant in the center of Moscow — high prices for rent and huge initial investment. This forces entrepreneurs to plan for the longer term. When an establishment in Brooklyn does not produce a profit, it may close the very next month; yet, in Moscow,a failing business will last for as long as it produces returns on at least some expenses.